Local Kia dealer Hendy Group will be ‘Doing Something Funny for Money’ to celebrate the 25th anniversary of Red Nose Day as the dealership prepares to support this year’s campaign. Our fundraising extravaganza for Red Nose Day aims to get the residents of Hampshire involved and tap into their charitable side for this very worthy cause. Local Kia dealer Hendy Group will be ‘Doing Something Funny for Money’ to celebrate the 25th anniversary of Red Nose Day as the dealership prepares to support this year’s campaign. 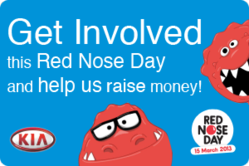 As one of a number of participating Kia dealers across the country, Hendy Kia is looking to raise funds for the charity as well as providing Hampshire residents with the opportunity to contribute to this Red Nose Day on Friday 15th March. Joining the likes of Red Nose Day’s national ‘Fun Raisers’ including Jessie J, Lenny Henry and Keith Lemon, Hendy Kia in Hampshire will be holding a car wash on Saturday 16th and Sunday 17th with the aim to raise £1200. Red Nose Day is all about driving positive change through the power of entertainment, and as a Supporting Partner of Red Nose Day 2013, Hendy Kia will be embracing this mission. Hendy Kia will be encouraging drivers to keep their noses clean and offering local motorists the opportunity to donate to charity as well as giving their car a bit of attention with the offer of a £10 car wash at the Kia dealership, with all proceeds going to Comic Relief. With a range starting from only (£7,795,) 0% finance options available; and every model backed by Kia’s outstanding and industry-leading 7-year / 100,000-mile fully transferable warranty, Hendy Kia will have you laughing all the way to the bank. Red Nose Day 2013 is heading your way on Friday 15th March when the great British public will once again be asked to Do Something Funny for Money. Raising cash this Red Nose Day can help to change lives forever. That’s because Comic Relief spends the money raised to help change the lives of poor, vulnerable and disadvantaged people across the UK and Africa. Comic Relief was launched on Christmas Day in 1985, live on BBC One. At that time, a devastating famine was crippling Ethiopia and something had to be done. That something was Comic Relief. The idea was simple – Comic Relief would make the public laugh while they raised money to help people in desperate need. Before too long, Red Nose Day was created and the first ever event in 1988 raised a staggering £15m. This year, 2013, marks the 25th anniversary of Red Nose Day which has raised over £600m and helped to change lives both in the UK and Africa.